Improving transport connectivity and increasing market integration could improve competition, trade, and potential for growth in small Liberian firms. Transport costs are a key factor in determining market integration. Consequently, keeping transport costs low is critical to economic development, particularly for small firms situated in isolated local economies. 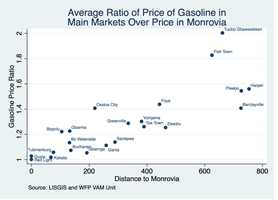 In Liberia in 2015, the price of gasoline, which is an imported commodity, was twice as high in isolated markets than in the capital. The preliminary findings of a recent study recognise five challenges, including truck and road maintenance and corruption on the road, as key transport industry factors undermining market integration in the country. Infrastructure development and access to credit to make small firms more competitive would help to address these challenges. Liberia, like many other African economies, is highly dependent on international trade. It exports commodities produced locally, mainly natural resources, and imports goods for its own consumption. Commodities need to be shipped from and to Liberia’s main harbour located in Monrovia, the capital. This impacts commodity prices. 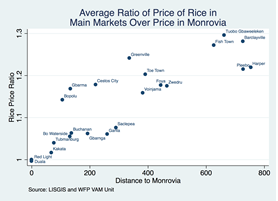 For example, the price of rice – Liberia’s staple food, mainly imported from Asia – is on average 30 percent higher in more isolated areas than in the capital. Therefore, connecting the capital with isolated markets and production areas, at a low cost, is crucial to developing the country’s local economies. In 2011, the Liberian government contracted a ten year credit with the World Bank to build a road on the main axis of the country. However, intra-national costs remain high, and most of the local markets are still isolated. To understand the challenges of the transport industry in Liberia, and reflect on the policy implications for government, an interview was conducted with more than 70 companies and 200 drivers based in Liberia’s main transport hubs. Here are some preliminary areas for reflection that have emerged from the data collected so far. When Liberian transport companies were asked what the biggest challenges are faced by their industry, they placed the cost of trucks and maintenance in the second and third place respectively, after road condition. For these companies, it costs on average USD 30,000 to buy a truck. This depends highly on the truck size, its age and whether it is new or second-hand. The local truck market doesn’t seem very well developed. Two-thirds of the trucks in the sample are directly imported from abroad by the transport companies themselves, mainly from the United States, China or Europe. Importing trucks to Liberia requires the payment of shipment costs and import taxes, meaning trucks may be significantly more expensive for Liberian firms than in other parts of the world where trucks are produced. The companies reported that buying a new truck is significantly more expensive than buying a second-hand truck. Given the state of the road in Liberia, which deteriorates the trucks’ condition, maintenance costs amount for a significant share of expenditure by these companies. In the sample, maintenance costs represent on average 19 percent of total expenditure. The high costs of trucks in Liberia are exacerbated by spare parts that are hard to find on the local market and, when available, very expensive. The firms interviewed are either small family firms with one or two trucks, or bigger firms with an average of eight trucks. Bigger firms are not very common in the Liberian context, and only represent one third of the sample. Among the smaller firms, owners usually drive the trucks themselves or hire a family member. 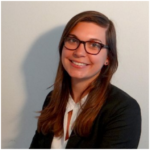 They face difficulties to obtain credits and to scale up their business. Only 23 percent of the trucks in the sample were financed through bank loans, but that percentage falls to five percent among the firms in the smaller firm category. Smaller firms seem to be facing big challenges that prevent them from growing, and credit constraints serve as one of the biggest challenges in this regard. Relaxing credit constraints for smaller firms appears to be a key factor for the market to grow. This may not only strengthen the capacity of pre-existing small firms, but also facilitate the entrance of new firms into the market. On average, truck drivers report having to pay a bribe every 30 minutes on the road. Trucking companies in the sample spend on average as much as eight percent of their expenditure on bribes. Amounts paid for bribes vary a lot starting at less than a dollar and escalating to more than USD 1,000. Most of the big bribes are paid when drivers are caught overloading their trucks. These bribes raise two issues. First, the firms paying bribes are not made entirely liable for non-compliance with the regulations, if the amount of the bribe is lower than the official penalty. Second, the bribes collected by local officers are not collected by the government, which undermines investment in building better infrastructure. In the case of overloading, the impact of the non-compliance is twofold: an overloaded truck is not only damaging to the truck itself, but also to the road that it is driven on. Last year, the government scaled up its efforts to control overloading. The “Axle Road Regulation”, issued by the Ministry of Transport, went into effect in July 2016 and limits the authorized load on the country’s roads. The government also planned the installation of two weigh stations in the country. These regulations, combined with efficient corruption control, may improve the sustainability of Liberia’s infrastructure. Transport companies in Liberia seem to be facing high marginal costs that prevent them from scaling up. One obvious way to facilitate transportation capacities in the country is to develop further infrastructure in the country, but there may be other measures to help transportation companies develop their businesses. These may make those smaller companies more competitive, and may also support entry into the market and push prices down. According to World Freight Rates, shipping a truck (of dimensions 5*2*2.5 m) from New York (USA) to Monrovia (Liberia) costs around USD $10,000. As a comparison, in 2015 in the United States, a study by the American Transportation Research Institute found an average of ten percent of expenditure was spent on repair and maintenance. The average age of the fleet in their sample is 8.7 years. The average age in our sample is 9.5 years.